Cronyn, one of five children, was born in London, Ontario, Canada. His father, Hume Blake Cronyn, Sr., was a businessman and a Member of Parliament for London (after whom the Hume Cronyn Memorial Observatory at the University of Western Ontario and asteroid (12050) Humecronyn are named). His mother, Frances Amelia (née Labatt), was an heiress of the brewing company of the same name. His paternal grandfather, Verschoyle Cronyn, was the son of the Right Reverend Benjamin Cronyn, an Anglican cleric of the Anglo-Irish Protestant Ascendancy, who served as first bishop of the Anglican diocese of Huron and founded Huron College, from which grew the University of Western Ontario. His great-uncle, Benjamin, Jr., was both a prominent citizen and early mayor of London, Ontario, but was later indicted for fraud and fled to Vermont; during his tenure in London he built a mansion called Oakwood, which currently serves as the head office of the Info-Tech Research Group. Cronyn was also a cousin of Canadian-born theater producer, Robert Whitehead, and a first cousin of the Canadian-British artist Hugh Verschoyle Cronyn GM (1905–1996). Cronyn was the first Elmwood School boarder (at the time Elmwood was called Rockliffe Preparatory School) and boarded at Elmwood between 1917 and 1921. After leaving Elmwood, Cronyn went to Ridley College in St. Catharine's, and McGill University in Montreal, where he became a member of The Kappa Alpha Society. Early in life, Cronyn was an amateur featherweight boxer, having the skills to be nominated for Canada's 1932 Olympic Boxing team. Subsequent to graduating from Ridley College, Cronyn switched majors, from pre-law to drama, while attending McGill University, and continued his acting studies thereafter, under Max Reinhardt and at the American Academy of Dramatic Arts. In 1934, the same year he joined The Lambs, he made his Broadway debut as a janitor in Hipper's Holiday and became known for his versatility, playing a number of different roles on stage. He won a Drama Desk Special Award in 1986. In 1990, he was awarded the National Medal of Arts. His first Hollywood film was Alfred Hitchcock's Shadow of a Doubt (1943). He later appeared in Hitchcock's Lifeboat (1944) and worked on the screenplays of Rope (1948) and Under Capricorn (1949). He was nominated for an Academy Award for best supporting actor for his performance in The Seventh Cross (1944) and won a Tony Award for his performance as Polonius opposite Richard Burton's Hamlet (1964). Cronyn bought the screenplay What Nancy Wanted from Norma Barzman, who was later blacklisted with her husband Ben Barzman, with the idea of producing the film and starring Tandy. However, he sold the screenplay to RKO which later filmed it as The Locket (1946). Cronyn also made appearances in television, The Barbara Stanwyck Show, the Alfred Hitchcock Presents episode "Kill With Kindness" (1956) and Hawaii Five-O episodes "Over Fifty, Steal" (1970) and "Odd Man In" (1971). Cronyn married the actress Jessica Tandy in 1942, and appeared with her in many of their more memorable dramatic stage, film and television outings, including The Green Years (1946), The Seventh Cross (1944), The Gin Game (1977), Foxfire (1982), *batteries not included (1987), Cocoon (1985), Cocoon: The Return (1988), and Camilla (1994). The couple starred in a short-lived (1953–1954) radio series, The Marriage (based on their earlier Broadway play, The Fourposter), playing New York attorney Ben Marriott and his wife, former fashion buyer Liz, struggling with her switch to domestic life and their raising an awkward teenage daughter (future soap opera star Denise Alexander). The show was scheduled to move from radio to television, with Cronyn producing as well as acting in the show. However, Tandy suffered a miscarriage and the show's debut was delayed a week. The series premiered in July 1954 to "warm and enthusiastic reviews"; eight episodes were aired. The couple had a daughter, Tandy, and a son, Christopher. Cronyn and Tandy lived in the Bahamas, then at a lakeside estate in Pound Ridge, New York, and, finally, in Easton, Connecticut. 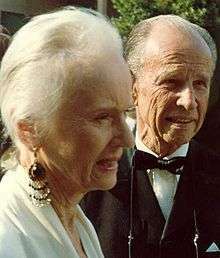 Jessica Tandy died in 1994, aged 85, from ovarian cancer. After he was widowed, Cronyn married author/playwright Susan Cooper (with whom he had co-written Foxfire) in July 1996. His 1991 autobiography was titled A Terrible Liar (ISBN 0-688-12844-0). He died on June 15, 2003, one month before his 92nd birthday. In 1979, Cronyn was inducted into the American Theatre Hall of Fame. On July 11, 1988 he was appointed as an Officer of the Order of Canada, giving him the Post Nominal Letters "OC" for Life. Cronyn was inducted into Canada's Walk of Fame in 1999. He also received the 125th Anniversary of the Confederation of Canada Medal in 1992 and the Canadian version of the Queen Elizabeth II Golden Jubilee Medal in 2002. He was awarded an Honorary Doctor of Laws degree (LLD) by the University of Western Ontario on October 26, 1974. His wife, Jessica Tandy, was given the same degree on the same day. ↑ "Hume Cronyn". Internet Broadway Database. Retrieved 28 November 2012. ↑ Fairfield, Connecticut (June 18, 2003). "Hume Cronyn dead aged 91". The Age. Melbourne. Retrieved 2010-11-07. ↑ "Lifetime Honors: National Medal of Arts". Retrieved 28 November 2012. ↑ The Complete Directory to Prime Time Network and Cable TV Shows, 1946-Present. Ballantine Books. 2013. p. 1440. ISBN 0-345-45542-8. ↑ Cronyn, Hume (1991). Terrible Liar. New York: William Morrow and Company. pp. 254–256. ISBN 0688128440. ↑ Gussow, Mel. "AT HOME WITH: Hume Cronyn and Jessica Tandy; The Driven Mr. and Mrs. Daisy". The New York Times. Retrieved November 28, 2012. ↑ "Overview for Hume Cronyn". Tcm.com. Retrieved 2016-08-27. ↑ "American Theatre Hall of Fame official website". Theater Hall of Fame. 2015-11-23. Retrieved 2016-08-27. ↑ "The Governor General of Canada > Find a Recipient". Gg.ca. Retrieved 2016-08-27. ↑ "Canada's Walk of Fame—Hume Cronyn". Retrieved November 28, 2012. ↑ "Hume Cronyn profile". Canadaswalkoffame.com. Retrieved 2016-08-27. ↑ "The University of Western Ontario: Honorary Degrees Awarded, 1881-present" (PDF). Uwo.ca. Retrieved 2016-08-27. ↑ "Suspense". Harrisburg Telegraph. November 9, 1946. p. 19. Retrieved September 15, 2015 – via Newspapers.com.